We encourage all nonprofit centers to register with carrots4 a cause here. The Equus Foundation is sponsoring this website, which links sponsors and other supporters with equine charities. Check out the International Horse Racing Digest. PATH Intl. receives a portion of every advertisement sold through this online magazine. Welcome to Professional Association of Therapeutic Horsemanship International! The Board of Trustees and Staff are proud to announce that NARHA is now officially the Professional Association of Therapeutic Horsemanship International. The association tagline is: Ensuring excellence and changing lives through equine-assisted activities and therapies. The new association web address is: www.pathintl.org. This name change will open doors to a myriad of inclusive possibilities and matches the growth of the EAAT industry. PATH Intl. vows to continue to provide its membership with an ever-evolving and progressive level of quality. The association promises the service members receive will be positive, knowledgeable and friendly. The educational opportunities offered will continue to challenge and enlighten. If you have questions about the name change, check out PATH Intl. 's FAQ page. We trust this evolution of our name will also serve to remind us all that our professional membership association is the sum of each and every member and professional, longtime and new; each and every center from small to giant. The association is a reflection of the needs and desires of its members, based on the sturdy foundation of a truly effective committee structure. This is YOUR association! Thank you to everyone who has played a role in making this association what it is and for helping with the naming process! The limited-time online registration fee of $475 for PATH Intl. members expires July 5, 2011. 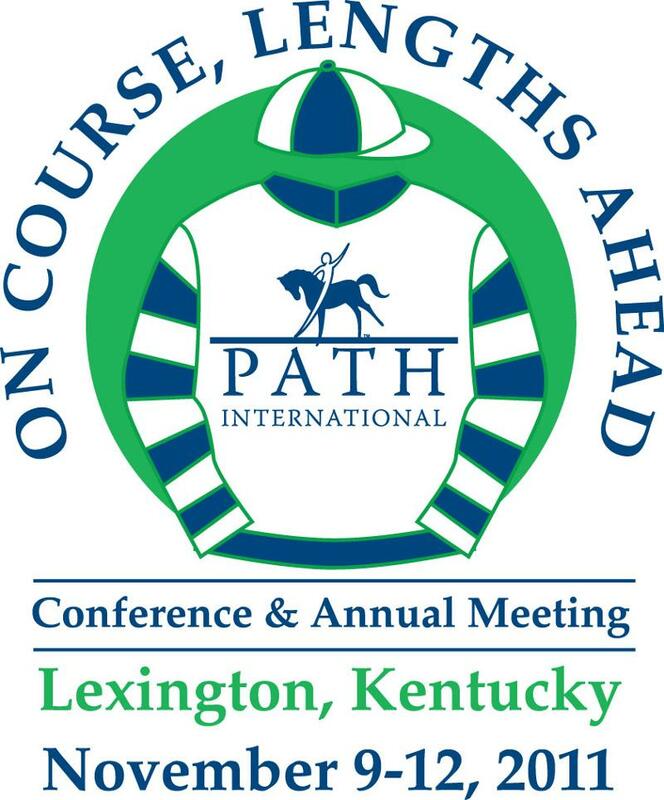 We are very excited to be able to offer our members a limited-time special registration fee for the 2011 PATH International Conference and Annual Meeting. You won't be able to pick sessions yet, but we know this conference will wow you with a variety of education tracks, keynote speaker Phil Tedeschi, the Big Lex Exhibitors Bash, the annual awards banquet, and the horse expo, which will be held at the beautiful Kentucky Horse Park, and The Mane Event closing reception. You will have the opportunity to select specific sessions once they become available. This offer is only available via online registration. No phone or fax orders will be accepted. Official online conference registration will begin in the summer of 2011. The 2011 summer issue of PATH Intl. Strides magazine will also include the hard-copy registration booklet for those preferring to register via fax or mail. This limited-time offer cannot be combined with any other discount offers (including the discount for Premier Accredited Centers). Click here to take advantage of the best savings for conference registration! Book a room at the Hyatt Regency Lexington: (859) 253-1234 or click here to reserve a room online. Use code g-NARH. If you call for reservations, be sure to mention you're with PATH International. Professional Association of Therapeutic Horsemanship International is proud to announce an exciting change to our video resubmission process. PATH Intl. now has the ability to accept video submissions online through a file sharing system. We are still accepting DVDs and VHS tapes, but we strongly encourage all potential instructors who need to re-submit a video to complete their certification process to utilize our new system. International candidates can also use this system to submit videos to PATH Intl. This new system will allow PATH Intl. to increase customer service to our certification candidates re-submitting videos for certification. This process will speed up our reviewing time, prevent damaged or lost tapes in the mail and hopefully make it easier for our members to submit their video. The system is easy to use; you can upload your video from your computer to our system. The video will be sent directly to the office and is ready to be reviewed by our PATH Intl. evaluators. Candidates will still need to mail or email the appropriate paperwork for their video re-submission and pay the re-submission fee (see your official results letter for more information) but will no longer have to worry how to get their video on a DVD or VHS! If you have an interest in using this new system as an Instructor In Training who needs to re-submit a component for certification to complete the certification process, email Abby Hendren for information. For all future candidates who may need to re-submit a video for certification, this information will be included in your official results letter sent to you by the PATH Intl. office about 30-45 days following your on-site certification testing. The Chronicle of Philanthropy has published an article on nonprofits losing their exempt status. This article also contains a link to the IRS page, listing which nonprofits have had their status revoked. If your status has been revoked, donors who wish to give to your center will not receive a tax write-off. Make sure that all your paperwork is filed properly. If you find that you are on the list, contact the IRS about getting your status reinstated. With all the recent flooding, fires and other natural disasters throughout our world, we at Professional Association of Therapeutic Horsemanship International want to remind our centers and supporters about the PATH Intl. Disaster Relief Fund. The purpose of this fund is to assist PATH Intl.centers with an immediate need in funding expenses not normally covered by operating insurance after natural or manmade catastrophic disasters. If you'd like to apply for funding, please contact Kay Green, PATH Intl. CEO. Also, if you'd like to give directly to this fund, please contact Megan Ream or donate here. The Professional Association of Therapeutic Horsemanship International knows its current members are the best possible source for new members who could benefit from all PATH Intl. has to offer. With our special Member-Get-A-Member drive, we've made referring colleagues to PATH Intl. easier than ever! Click here to learn program details! Remember, the deadline is June 30 to be entered into the Rein 'Em In Member-Get-A-Member Drive. The Equine Specialist in Mental Health and Learning FAQ page has been updated. Click here for the updates. If you have questions that are not answered there, contact Tara McChesney at (800) 369-7433, ext. 114. Ultimately it is every candidate's responsibility to ensure all requirements for certification have been met by the appropriate deadlines and that his/her mentor is a current instructor with PATH Intl. Be sure to review all policies and procedures in our registered booklet, updated frequently on the PATH Intl. web site. It has recently been updated. Download the booklet and review it so you are aware of all requirements and policies for your certification. If a candidate is found to have completed their 25 hours of mentoring under an expired or non-compliant instructor the candidate will pay a $150 fee to the PATH Intl. office prior to his/her certification results being released and officially recorded. A certification candidate can not act as an instructor until this fee is paid and the hours performed under an expired or non-compliant mentor will need to be performed again and turned into the office within 90 days of notification from the PATH Intl. office. If the hours are not complete within 90 days you will begin your certification process from the beginning. A certification candidate MUST show up to the certification testing with 25 hours of practice teaching under a current PATH Intl. Certified Instructor. If these hours are not in hand you cannot test. If these hours have been completed with an instructor who is not a current PATH Intl. instructor you will be assessed the $150 fee and have to submit proper hours to the PATH Intl. office within 90 days. In addition to this update please be aware that any certification candidate who tests at a certification after June 1, 2011 needs to demonstrate a proper posting diagonal for their riding pattern. This is one of the many listed, required criteria in the certification booklet. In the past western riders did not need to show a proper posting diagonal just a posting rhythm, this policy has been changed. All riders, no matter the discipline, must show a proper posting diagonal. If you need assistance please consider taking lessons from a qualified instructor to learn proper posting diagonals. The PATH Intl. Registered Instructor Criteria requires that all candidates demonstrate posting on the correct diagonal during the riding pattern. Posting on the correct diagonal refers to posting in rhythm, at the trot, in unison with the diagonal pair of legs indicated by the horse's inside hind leg and outside front leg. When the rider changes direction it is expected that the rider will change the posting diagonal to continue to be in unison with the horse's inside hind leg and outside front leg. Your body should rise out of the saddle when the outside front leg and inside hind leg of the horse move forward. The purpose of the demonstration of posting on the requested correct diagonal is to show the candidate's knowledge of diagonals, the trotting rhythm and gait, and also how to conduct a change of the posting diagonal. If you have any questions please feel free to call (800) 369-7433. Abby Hendren (ext. 104) and Jared Smith (ext. 126) are happy to assist you in your certification process. Want to Host an Equine Specialist Workshop? It is exciting to see so many individuals interested in the PATH Intl. Equine Specialist in Mental Health and Learning workshops. We would like to accommodate individuals eager for certification by holding more Equine Specialist workshops and practical horsemanship skills tests, especially along the west coast. Help us schedule these workshops. Start thinking about your 2012 schedule; we would love to get your event on the calendar and begin advertising for it. All workshops will now be offered with the new Equine Specialist practical horsemanship skills test, if the host site chooses. Host sites can also host the one-day practical horsemanship skills test without a workshop if they wish, a requirement for certification. If anyone is interested in hosting at their Premier Accredited facility, please download the intent to host booklet or for more information contact Abby Hendren at (800) 369-7433, ext. 104. The PATH Intl. Standards for Certification and Accreditation manual has grown and evolved with new programs added over the years. Standards have been added and rewritten to fit the needs of the new programs. The time has come to evaluate and reorganize the manual to bring it up to best practices and make it easier to interpret and implement. If you have the time and an interest in helping the association make the Standards Manual more up to date and inclusive of our diverse equine-assisted activities and therapies industry, please consider joining a new task force that has been formed to examine ways to improve the manual for centers, instructors and others in the field. To apply for consideration by the task force co-chairs, please complete the volunteer application form on this page and submit it to Jama Rice no later than June 30. In February 2011, the Equine Welfare Task Force officially became a PATH Intl. standing committee - the Equine Welfare Committee. The committee seeks enthusiastic, open-minded, dedicated individual members to join us in supporting our equine partners and other animals that may assist us in our unique fields. If you might be interested in volunteering for the association as a committee member, see the full job description here. Express your interest by submitting for review by the committee chair and members the volunteer application found on this page to Jeff Kelling no later than July 1. Some committee members are getting huge phone bills because they are using their cell phones rather than a land line for committee calls. If you use Verizon, you can put the conference call number on your "friends and family" plan. PATH Intl. is looking into this, and we will provide you with more information when we have it. Unless otherwise noted, contact Abigail Hendren at (800) 369-7433, ext. 104 for further information. All dates are subject to change. To register for an event, please contact the host site directly. You can locate their contact information under the Find a Center link on the PATH Intl. home page or on the PATH Intl. events calendar. If you are interested in attending, please call the center immediately. The driving demo workshops do count toward gaining PATH Intl. driving certification. Please visit the PATH Intl. calendar for a list of 2011 Registered On-Site Workshops and Certifications.